Bloggers have taken it upon themselves to school authors in basic author/reviewer etiquette. The general consensus is that authors should avoid commenting on their reviews in order to save face. Just a few days ago, there was a discussion on whether or not YA authors should voice their political opinions because they might subliminally program their readers into making bad choices or seeing opposing view points. That's an overstatement, but it generally sums up the opinion of a few YA bloggers: teens are idiots who can't think for themselves. But what happens when the shoe is on the other foot? I know most of you heard of the Be Nice incident surrounding Becca Fitzpatrick's post on livejournal. Some interpreted it as an article to scare off bloggers from writing negative reviews lest they destroy their future writing careers. Others took it as the best advice they'd heard in years and ran off to delete any negative or overly snarky reviews they might have written, ignoring the fact that reviews aren't written for authors, agents, or editors. That's what a beta reader/critique partner is for. But now that we've seen the other side of the curtain, here is my question to you: who will keep YA bloggers inline? On internet forums, we have moderators. They can ban trolls and delete their comments, but if you've ever been to FanFiction.net, you know how useful they are. On YouTube, there are countless rude comments, probably made by teens who were just graced with a computer. And on GoodReads, there are those who simply don't understand that the internet is indeed public. Anything you say, unless it's through a private message, can be viewed by the public. Regardless of that, the internet is still a public place. If you call so and so blogger a dirty name, it will come back to bite you. Anyone can link to your comments or reviews without permission. In English class, that's called a citation. If you really must defame someone online, remember that the internet is a small place. Information gets around. Just a few days ago, I rated a book with plans to review it. It gets back to me that the author of said book mentioned my rating in an interview with her agent. Long story short, I remembered to review the book and said author might have appeared a little foolish or petty afterwards. No one will be your moderator. You must mod yourself. Age is no excuse for being an idiot. Being a so called professional is no excuse for being callous. It would probably be smart to keep inside jokes and comments that can be taken out of context to yourself. And if you must share them, send them to your friends in a private message. I don't like the idea of being talked about behind my back, but it's better than risking your internet reputation. Remember that girl who didn't mean to make racist comments against Asians in her UCLA video? I believe that she had to transfer schools and delete her YouTube account. Anything can go viral within a matter of hours. That's not to say that you shouldn't express your opinion, but that you can do so without coming off as a jackass. 1. If you feel like you're being rude, leave a disclaimer at the bottom of your comment. Usually your instincts are right. This will save you a little face. 2. If you're angry or generally emotional, step away from the computer. Take a deep breath and return ten minutes later. If you're still upset, repeat those steps. 3. Refrain from making offensive comments towards others in public forums. Make the conversation private. 4. If your opinion is controversial, it might be best to keep it to yourself. If you're against Prop 8 or you don't think Obama is an American citizen, why would you want to broadcast it to the internet? 5. If you're new to the internet, you might want to sit back and lurk. Learn the ropes before you make a fool out of yourself. Remember, just because you're online, that doesn't mean you're not talking to human beings. Be polite. Be courteous. And don't be a n00b. 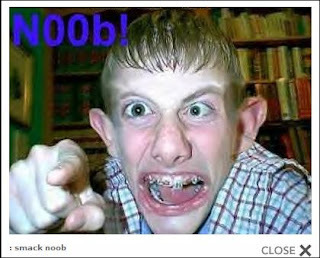 n00bs can turn into trolls very quickly in internet land. Fantastic post! A lot of the things you say ring true. I have those days where I'm frustrated and want to vent, and it can be so tempting but your're right. Think before you cant because the slightest word spreads like crazy. "No one will be your moderator. You must mod yourself. Age is no excuse for being an idiot. Being a so called professional is no excuse for being callous." I get very annoyed when age is brought up, as if age justifies stupidity? I don't think so. Unless you don't have the capability to recognise right from wrong I'm awfully sure that you're fully aware of your actions, even when you mess up. I have done things that I might cringe at a bit looking back now, or think that was a bit harsh or risky, but I don't think I would change them because it felt right saying those things then and those words still remain for everyone, I haven't removd them so I suppose inside I still stand by those words. If you stand by what you say then be prepared to deal with the consequences like I have and ride it through, or if you think you're in the wrong admit it and work on bettering yourself. The worst thing you can do is make excuses. Great post :) I do write negative reviews but not offensive or rude reviews. I always try to say that the book wasn't for me and at the same time try to list what was positive with the book. I hope that is ok, I don't think bloggers should be afraid of writing a negative review but they should be careful with how/what they write. your opinion unless you know that you're offending someone. 4. If your opinion is controversial, it might be best to keep it to yourself. If you're against Prop 8 or you don't think Obama is an American citizen, why would you want to broadcast it to the internet?" Isn't this EXACTLY what you just complained about me saying? If you have a controversial opinion isn't it better to keep it to yourself? No one should be denied the right to state their opinion even if it isn't popular. person. Thank you. Take this up with her. Again, this is a team blog, like it says right there on the welcome tab. Obviously Cory's opinion differs a little from mine. And, I'm not speaking for her or anything, but I think she's talking about people who post deliberately inflammatory content. I could be wrong, of course, and she could just mean that every controversial statement must be kept to oneself, but I doubt it, since I am taking the statement within the context it was presented. Ummm... in regards to #4 - Why should you keep an opinion to yourself just b/c it's controversial? So it's okay to post your opinion, as long as it's not going to create any waves? Screw that. If you have an opinion that you feel like sharing - whether it be about politics or what toilet paper brand you think is best, go ahead and freaking share it. Here's the thing - it's your blog. Say whatever the hell you want. Some people might not like it - they may post rude comments, or they may stop following your blog, but who cares? It's YOUR blog, don't censor yourself just because you're afraid people will disagree. Hell, isn't the whole POINT of book blogging to share your opinion? And, it kind of seems like you're trying to draw this "controversy" out. This is the 2nd post on this blog picking at Pam for posting her opinion of a particular author's vlog. Let it go already. I always thought that defending an opinion by saying "I have a right to say what I want" is the weakest argument there is. Sure, you have a right, but that doesn't protect you from people poking holes in your argument or thinking you're an idiot. Marketing-wise, I think it's best to know who you want your audience to be. If your ideal reader is the birther crowd, then by all means post loony conspiracy theories on your blog. Me? I don't think people who are into Donald Trump are going to like my books much anyway, so I have no problem bashing him in public. In my first book I made a lot of jokes about the idea that schools have "permanent records" that will stop you from getting a job if they say you got into a fight in third grade. But the internet is real, and it works just like that. I am SO glad I didn't have a blog at 15. Oh, the crud I would have posted. stupid thought or controversial opinion that runs through your head? rather avoid the drama that comes with being controversial, ie n00bs. ago. Nothing against her personally. I don't even know her. Like I said, being rude and disagreeing with someone are two different things. Of course there's no hypocrisy in blogging about how authors are people too and then lambasting one of them for having an opinion. I'm sorry, I didn't see anybody picking on Pam in this post... *looks around* nope, no picking. A mention in passing of a current event relevant to the subject matter of the post cannot be construed as 'picking on'. Also, it's a little ironic that my disagreement with Pam's opinion has been construed a "controversy". Did I, at any point say that that blog post should not have been written? No. Did I disagree strongly with her opinion, yes? Have commenters like you turned this into a "controversy"? Yes. Do I wish it were, in fact, NOT a controversy, but merely an opinion piece disagreeing with someone else's opinion? Hell, yes. If your opinion is controversial, it might be best to keep it to yourself. This is not, in fact, an order to shut up and sit tight on your thoughts forever and ever. It is a suggestion for people who are either a) unwilling to court controversy, but unaware of how quickly things can go viral on the internet, or b) are deliberately contemplating courting controversy by being inflammatory. The use of the word 'might' suggests that you are free to exercise discretion on it. So you know, we might be able to "let it go already" if only people would let us. I'd take #2 WAY further than that and say if you're emotional to step away from the computer for a much longer duration of time. At least that's how MY emotions work. Ironic to find an article about netiquette hotlinking an image. Actually, anybody who's willing to protest something is telling random people they're pro/against something. So lots of people are just fine with the idea! Additionally, a blog that acts on all topics with the propriety of strangers passing in the park is going to be dull. Blogs build communities by being distinctive. This article is focusing on forum/general commenting netiquette. Not whatever netiquette hotlinking goes under.